Heritage Hall is both a museum and a welcome center. It is intended as an amenity for patients, staff and guests of Mayo Clinic. Due to issues of security and patient privacy, we cannot open Heritage Hall to the general public or groups that are not sponsored by Mayo Clinic. This website is intended to complement the experience of visiting Heritage Hall in person. 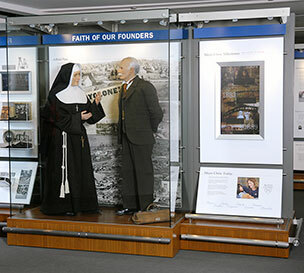 Through displays and multimedia presentations, Heritage Hall connects Mayo’s history and current activities, showing the key role of philanthropy in advancing Mayo’s mission of excellence in patient care, education and research. Heritage Hall is open from 8 am-5 pm, Monday-Friday, at no charge. The museum is handicap accessible and meets standards of the American with Disabilities Act. Exhibits change periodically, so stop by to see what’s new! Scottsdale, Ariz.: Concourse (below ground) level of the clinic building.